Consumer packaged goods (CPG) companies often outsource final packaging to outside contract packagers, adding a costly and time-consuming step between manufacturing and the distribution center. 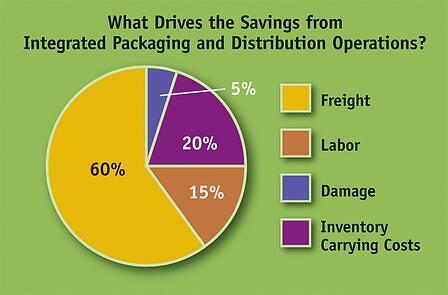 Why not integrate final packaging into existing warehouse distribution operations? Doing so can reduce combined distribution, packaging and transportation costs by 30%, and can cut at least 7 days in order-to-delivery cycle time. The following chart shows where money can be saved. Combined packaging/distribution has become possible with the increasing sophistication of a select group of third-party logistics providers (3PLs), who have invested in the equipment and resources to take on complex packaging assignments. Packaging done in 3PL-operated distribution operations eliminates costly runs to outside packagers and shortens the product customization cycle. Reduced labor and equipment. Combined packaging and warehouse distribution operations allow for labor and rolling stock to be deployed where it’s most needed at any given time, across multiple functions. Cross-trained workers can be available to address peak demands in the DC or the co-pack area.